Sir William Drummond Stewart was a Scottish nobleman who arrived in North America in search of adventure in the Rocky Mountains and eventually fell in love with the scenery, people and the life there. He was also a British Military officer. He was a very unique mountain men who spent seven years of his life in the western wilderness as a hunter and also a brigade captain. In the last years of his life, as his finances were more than enough and with luxuries, he became a type of prince of wilderness. 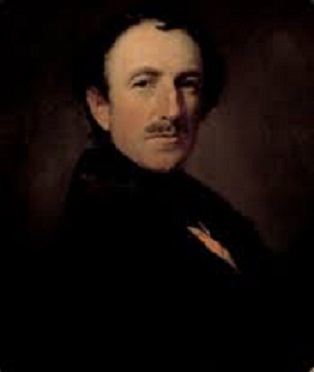 William Drummond Stewart was born in December 1795 at Murthly Castle in Perthshire of Scotland. His father was Sir George Stewart who was the 17th Lord of Grandtully and 5th Baronet of Murthly while his mother was Catherine who was the eldest daughter of Sir John Drummond of Logiealmond. William was the second of the five sons and two sisters to his parents. William and his older brother John never get along with each other, however, the enmity between them increased as they grew older. William was educated by tutors at home only. It was a trend that only the eldest son could inherit the estate and title from the father. As William was the second son, he decided to choose the Army. In 1812, after his 17th birthday, at the age of military service, he asked his father to buy him a cornetcy in the elite 6th Dragon Guards. On April 1813, his appointment was confirmed and he immediately joined his regiment and started his rigorous training. As William was very excited to participate in military action, he made an application for the position of lieutenant in the 15th King’s Hussar. His appointment was confirmed on January 1814. Stewart then joined his regiment and consequently saw combat in the Waterloo campaign in 1815. Stewart was promoted to Captain in June 1820 and then he retired on half pay. In search of adventure, Stewart traveled to St. Louis Missouri in 1832 where was introduced with William Clark, William Ashley, and many other important residents. He decided to join Robert Campbell to take part in the assignation of mountain men in 1833. They left on 7 May and visited the Horse Greek Rendezvous in Green River Valley in Wyoming. Stewart there met a French Canadian Cree hunter Antoine Clement with whom he had some homosexual relationship. Their relationship lasted for almost 10 years which is described in autobiographical novels of Stewart. He visited Bog Horn Mountains that are wintered at Taos with some men and attended his next trip at Ham’s Fork of the Green River. In the same year, he also visited Fort Vancouver. In 1835, he attended the rendezvous on the Green at the mouth of New Fork River and arrived at St. Louis in November. After reaching to St. Louis he found out that he is in a financial crisis as his brother had not given him his share from the estates left by his father. So he went to New Orleans investing in cotton to recover his losses and then resided in Cuba. Later in 1838, he discovered that his brother who was childless died because of some disease and he was now to become the seventh baronet of Murthly. Stewart hired an American artist in New Orleans named Alfred Jacob Miller and took him along in his rendezvous of 1837. Miller painted many series of work on the mountain men, American Indians, and the Rocky Mountain scenes. He delivered all those oil paintings to Stewart by 1839 and he had hung them in the lodge of his Murthly estate. 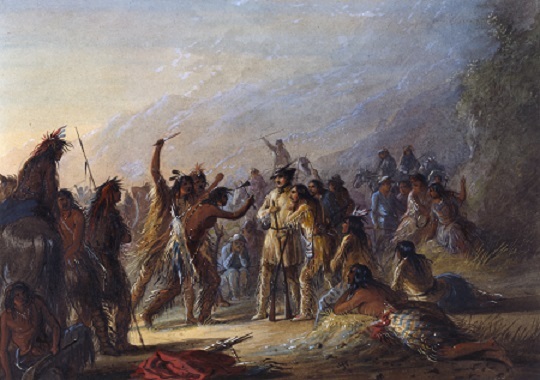 One such painting where Miller recreates a scene that depicts Stewart standing his grounds against the Crow Indian was very famous. Stewart then returned to Scotland in 1839 with his partner Antoine Clement who was first introduced as his valet and then as his footman. They lived in the Dalpowie lodge of the estate. William had an illegitimate son named William George Drummond Stewart who was born in 1831, by his servant Christian Marie Battersby. He took financial responsibility of both mother and son but never lived together with them under the same roof as Christian. In later life, he did marry her to legitimize his son “Will” for inheritance purpose. His son Will Stewart had a prospering career in British Army and he was awarded the Victoria Cross for his duty to free the Siege of Lucknow during the Indian Mutiny. His later life was full of chaos and estrangement because of his family. His son Will died being self-inflicted from the sword swallowing injury in 1868. In1856, a friend of Stewart Ebenzer Nichols visited him from Texas along with his wife and three sons. The middle son of Nichol’s, Franc, denied returning home. He decided to stay with William at Murthly Castle and eventually was adopted by William and became his heir. Stewart died because of pneumonia in April 1871.